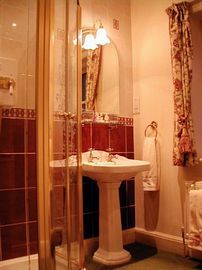 Exquisite Heather Cottage Guest House is non-smoking and situated in Aysgarth in the North Yorkshire Dales National Park. The property is a charming Edwardian country gentleman's residence, which has been substantially renovated and restored and is crammed with beautiful antiques and features. Guests benefit from spectacular views over Wensleydale and Lady Hill. The halls are oak panelled with oak floors and stained glass windows in the fashion of the arts and crafts period, adding to the B&B's charm and character. We offer two beautifully furnished, fully en-suite Bed and Breakfast rooms, both South facing overlooking the Edwardian Rock Garden. 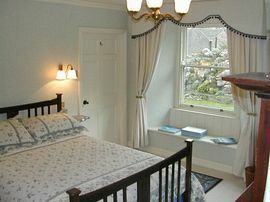 Both rooms are equipped with TV, DVD player, Tea and coffee making facilities with fridge, hair dryer and Alarm clock. There are a selection of freely available DVD films and CD music discs for your entertainment. 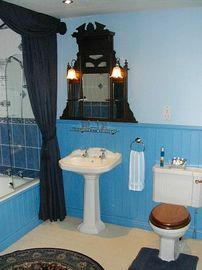 Both rooms are comfortably furnished with antiques and are bright and spacious. Our Bainbridge room has a luxurious en-suite bathroom and shower over, whilst our Wensley room has antique French double bed and a spacious en-suite shower-room. Heather Cottage B&B is the perfect base for walking and cycling in the Yorkshire Dales and is a short stroll from the famous Aysgarth Falls. Perfect walking territory nearby, includes the Herriot Way, the Bowland-Dales Traverse and we are close to the Pennine way. Packed lunches can also be provided if required. Relax and enjoy a hearty breakfast in our separate dining room, furnished with antiques with stained glass windows to the rear and overlooking the Edwardian rock garden to the front. Off-road parking is available for 3 cars behind the house. We also have facilities for secure bicycle storage and a garden area by the pond, where you may watch the sun set over picturesque Lady Hill. 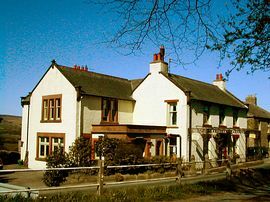 Fantastic choice of pubs and restaurants in the dale to choose from. The Aysgarth Edwardian Rock Garden, which both B&B rooms overlook, is one of the few examples of a Backhouse rock garden remaining in the UK. Built in the early part of the 20th century, this garden is visited and admired by many alpine gardeners each year and has recently been the subject of magazine articles and Television programmes, which charted its restoration and re-planting. Aysgarth Edwardian Rock Garden is part of the property. Spectacular views over Wensleydale and the Garden. Aysgarth is in the middle of Wensleydale, midway between the market towns of Leyburn and Hawes. Heather Cottage is in Aysgarth village, on the A684 opposite the Rock Garden, as you leave the village travelling west. 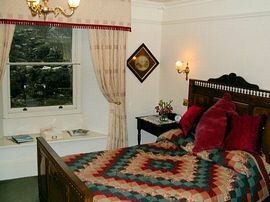 £62.00-69.00 per night for double en-suite room with breakfast. If you have questions about this bed and breakfast in particular please contact them via the means below.